DOHA, Qatar (AP) — U.S. officials sought to shore up support Sunday for a tougher stand against Iran's nuclear program by saying Tehran had left the world little choice and expressing confidence that holdout China would come around to harsher U.N. penalties. President Barack Obama's senior military adviser called for more time so diplomatic pressure had a chance to succeed and said from Israel, which considers Iran a strategic threat and has hinted it could attack if negotiations failed, that such action could have "unintended consequences" throughout the volatile Middle East. U.S. Secretary of State Hillary Rodham Clinton, on a quick visit to Persian Gulf allies Qatar and Saudi Arabia, said in a speech that Iran has not lived up to its nuclear obligations and has rebuffed U.S. and international efforts to engage in serious talks. As a result, Clinton told the U.S.-Islamic World Forum that the U.S. and others were working on "new measures" to try to persuade Iran to change its course. "We do not believe Iran should be a nuclear weapons power," Clinton said at a news conference before her address. She criticized Iran's defiance and said Tehran would not succeed in overcoming international opposition to it nuclear ambitions. In an exchange with the audience after the speech, Clinton said, "It's time for Iran to be held to account for its activities." The United States and some of its allies suspect Tehran is using its civilian nuclear program as a cover to build nuclear weapons. Tehran denies the charge and says it only has peaceful intentions. Obama has said that work to broaden economic sanctions in the U.N. Security Council is moving along quickly, but he hasn't given a specific timeline. China, one of five permanent members of the Security Council, has close economic ties to Iran and can block a resolution by itself. "We have the support of everyone from Russia to Europe. And I believe we'll get the support of China to continue to impose sanctions on Iran to isolate them, to make it clear that in fact they cannot move forward," U.S. Vice President Joe Biden told NBC's "Meet the Press" from Canada, where he was attending the Olympics. "We need to work on China a little bit more," added Obama's national security adviser, James Jones. "But China wants to be seen as a responsible global influence in this. On this issue, they can't, they cannot be nonsupportive," he told "Fox News Sunday." U.S. Adm. Mike Mullen, chairman of the Joint Chiefs of Staff, said in Tel Aviv that it was important to let diplomacy and international pressure work. While every situation has limits, he said, "we're not there yet." Clinton's stops in Qatar and in Saudi Arabia coincided with a string of diplomatic and military contacts in the Middle East, including Mullen's visits to both Egypt and Israel. Her top three deputies — James Steinberg, Jacob Lew and William Burns — were expected in the region in coming days. So was Gen. David Petraeus, chief of U.S. Central Command with responsibility for U.S. military operations across the Middle East. Their agenda is not focused exclusively on Iran. There also is an American push for closer cooperation in Yemen against al-Qaida, a move toward bolstering diplomatic relations with Syria and efforts to get Israeli-Palestinian peace negotiations back on track. Clinton's trip follows closely on the Iranian president's claim that his country had produced its first batch of uranium enriched to a higher level. Mahmoud Ahmadinejad also insisted on Thursday that Iran had no intention of building nuclear weapons, yet would not be bullied by the West into curtailing its nuclear program — a reference to new U.S. financial penalties imposed a day earlier. After an overnight flight from Washington, Clinton went directly into a series of high-level meetings in the Qatari capital ahead of her evening speech. Obama addressed the forum by video on Saturday, announcing his appointment of a special envoy to the Organization of the Islamic Conference, which represents nearly 60 Muslim states across four continents and promotes Muslim solidarity in social and political affairs. In Cairo, Mullen said after meeting with Egyptian President Hosni Mubarak that Iran was a key challenge to the security of the Middle East. He accused Tehran of spreading its radical influence in Lebanon, Gaza, Yemen and Iraq, and said the U.S. would work through the Security Council to seek new sanctions. Saudi Arabia and Qatar, both situated across the Persian Gulf from Iran, are concerned about Iran's nuclear ambitions. They are seen by the Obama administration as an important part of a regional effort to persuade the Iranians that it is in their economic interest to give up their uranium enrichment program as called for in a series of U.N. resolutions that Iran has ignored. 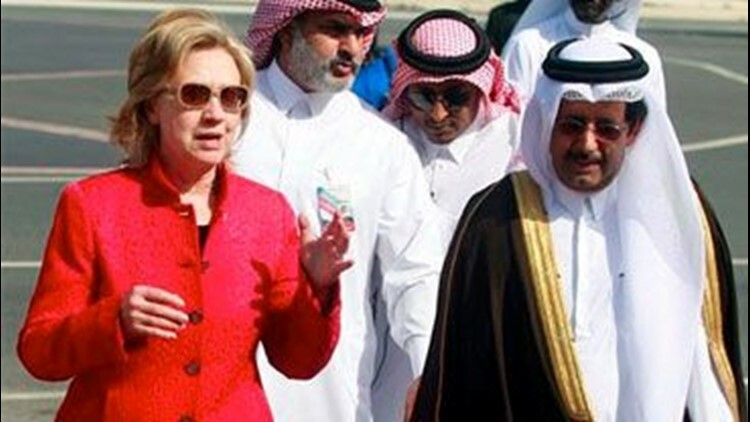 The State Department's top Middle East policy officer, Jeffrey Feltman, who accompanied Clinton, told reporters on the flight from Washington that Iran would figure prominently in Clinton's discussions in both Qatar and in Saudi Arabia. Feltman said the U.S. believes the two Gulf allies, as well as other countries in the region, can help "sharpen the question for Iran" as to whether it is better off continuing to seek higher-enriched uranium that is closer to weapons grade or halt the program. "We would expect them (Gulf allies) to use their relationship in ways that can help increase the pressure that Iran feels," Feltman said.